Call, Email or Submit this online form to schedule your next show with us. Other than these options, electrical power is something that can be discussed more in detail via phone or email. Any equipment seen in these descriptions, is solely owned and is “in-house”, so there will not be any renting of equipment or “add-on’s” put on the final bill. We have the availability to run multiple shows at a time. 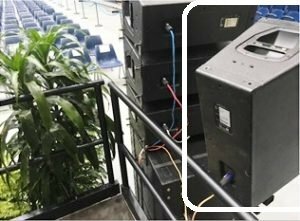 Sound reinforcement or “PA” (public address) is a speaker system that the audience hears. 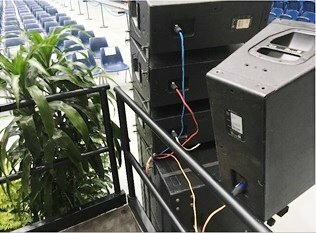 This speaker system is on chain motors, on each side of the video screen. What is load in time? Generally it take a few hours to setup the recommended PA (this is setup 2). Load in time is that window of time. What is a rain plan? 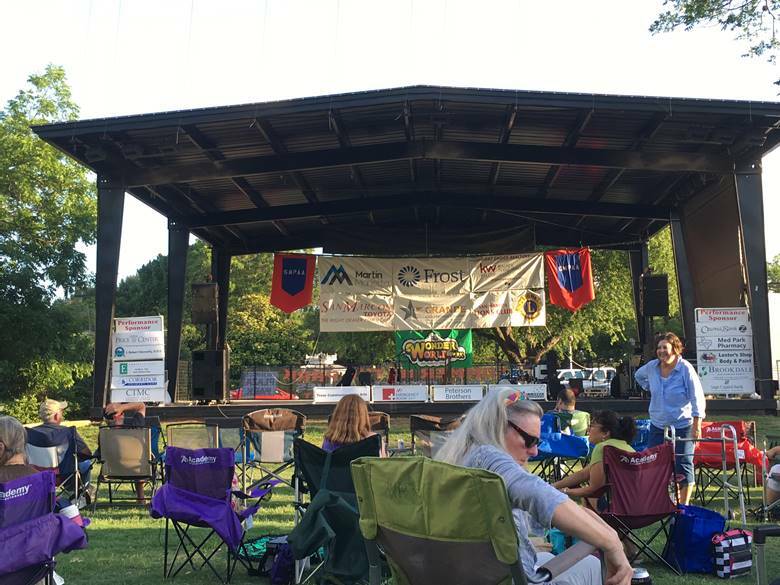 Due to the weather in Texas being unpredictable, a rain plan is needed for outdoor shows. 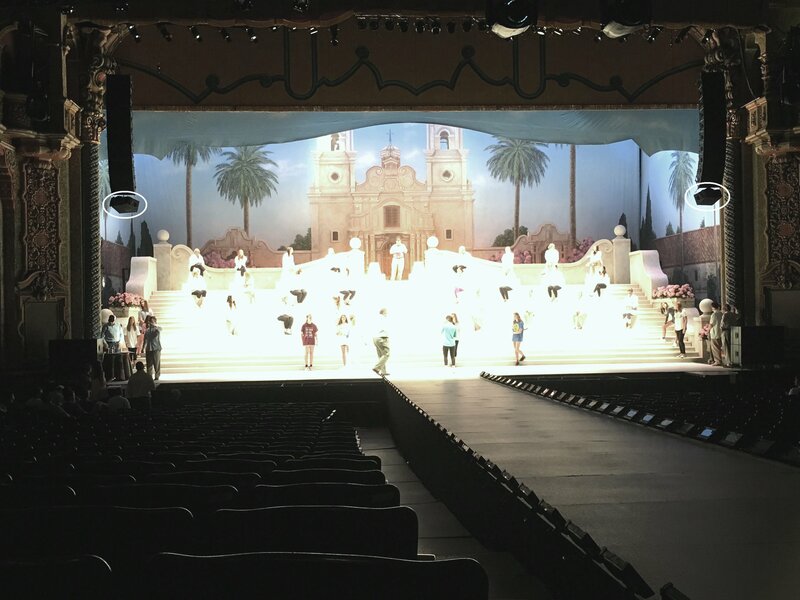 Simply put, this is another location, in which rain will not be a hindrance to the equipment, the performer(s), or the people watching the show. What is a Sound Wing? 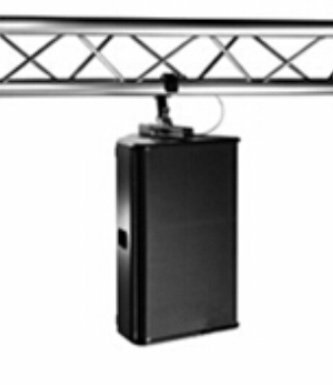 It is corners of the stage to set PA on that doesn’t interfere with the space of the stage itself. 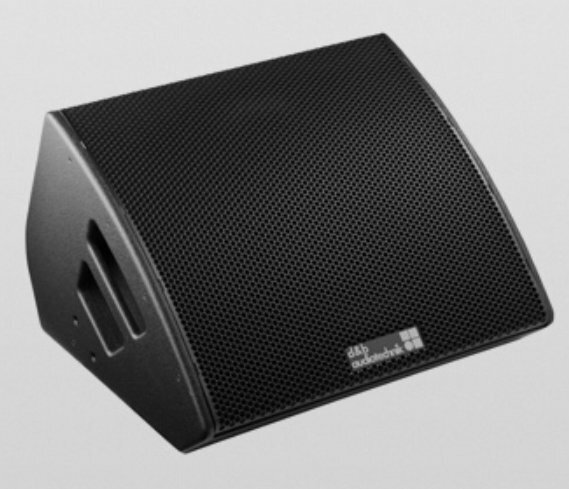 A floor monitor is a speaker on the floor facing the performer which allows him or her to hear themselves at the level of volume they decide, as well, have a tailored mix of other instruments and voices on stage. 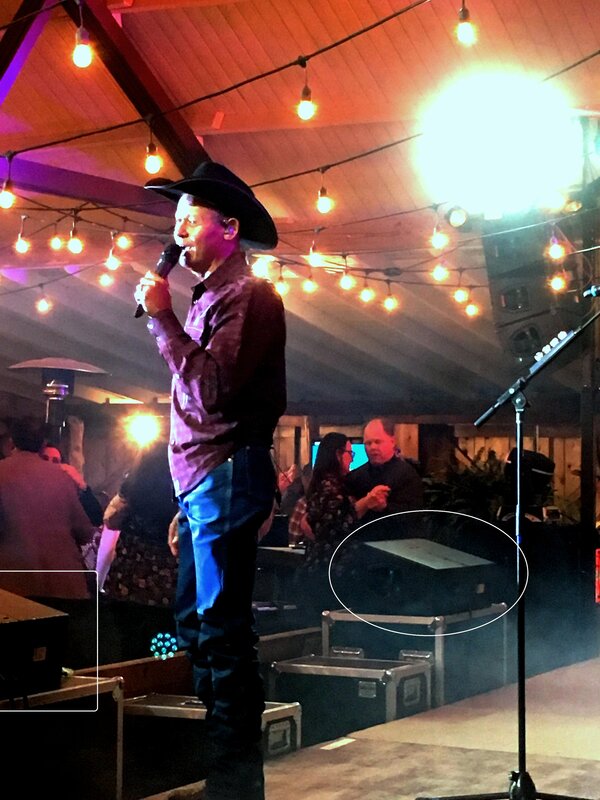 A side-fill monitor is the same thing as a floor monitor, and can either be floor monitors at the front corners of the stage facing in at an angle, or the speakers are lifted up to a desired height and are on each side of the stage facing in. 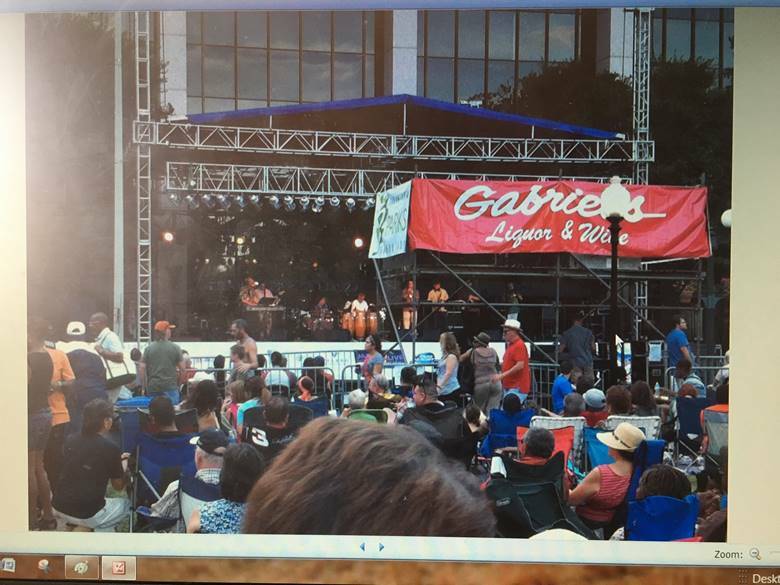 The 2 pictures of side fill monitors shown below are those on the side of the stage facing in. One of the pictures is with a sub underneath. 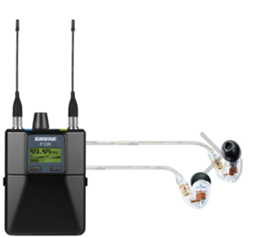 An IEM (in-ear monitor) is the same as a floor monitor, except the speaker is a wireless headphone earbud(s) and can either be 1 (mono) in one ear, or 2 (stereo) one in each ear. 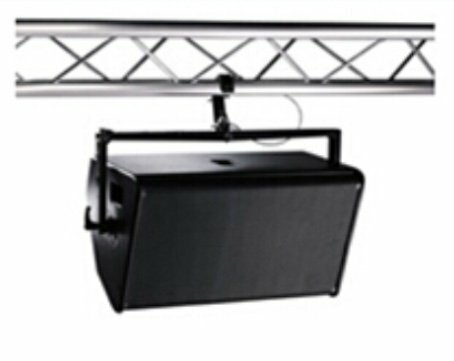 A OH monitor (overhead monitor) is usually in places such as theatres, that have pipes for drapery and scene changes. An OH monitor would be securely attached to one of these pipes and flown out overhead. A hotspot monitor is the same as a floor monitor, except it is mounted on a mic stand, or set on something. 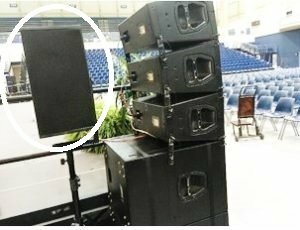 A front-fill, and out-fill speaker- Depending on the width and depth of the stage, 1 to 4 speakers (front-fills) are placed either on the stage or something else to provide even coverage of speech intelligence to the audience either seated or standing at the center of the stage. The next two pictures have front-fills speakers in them. 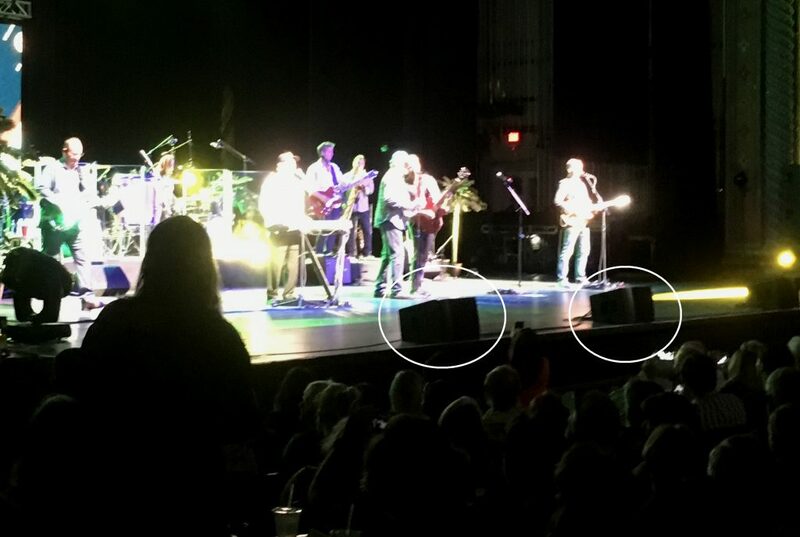 An out-fill speaker is the same as a side-fill speaker, except is turned half around to face an audience that may be seated on either side of the stage, but behind the speakers pointed towards the audience. 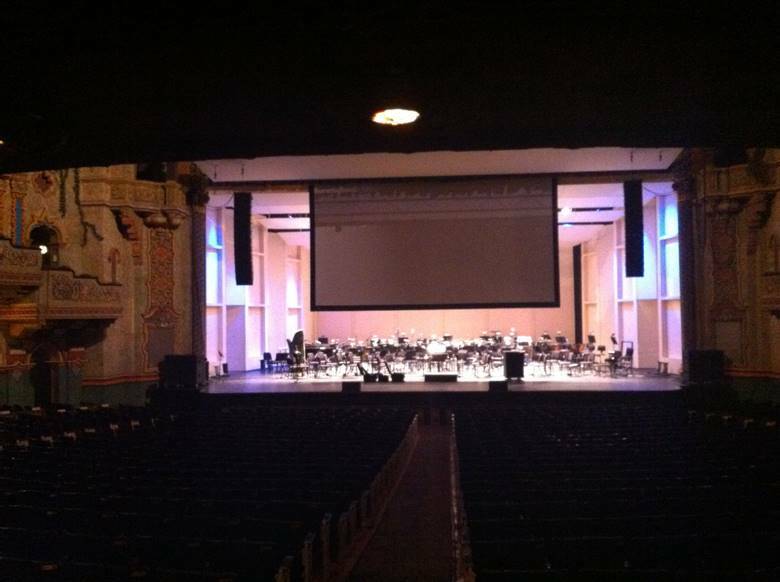 The use of out-fill speakers are found in places with seating on side of the stage- Ex. VIP, etc..
What is a ryder spec sheet? 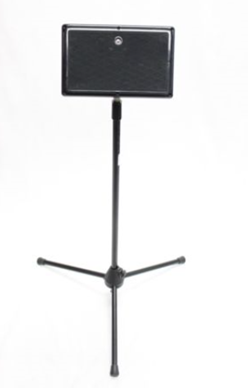 A ryder spec sheet is a list of the type of equipment a band (the act) has required to be provided for the show. Whomever is promoting the show usually signs a contract from the act stating that they will provide all that is on the contract. In saving frustration, money spent, and headache, before the contract is signed, it is beneficial that the company(s) hired are put into contact with the act, to determine whether the equipment provided is adequate. What does each Setup look like? Here are some examples of the various Setup configurations. These setups are to give a general idea of our systems. Any one setup can be customized to work for any particular needs or wants of the client. 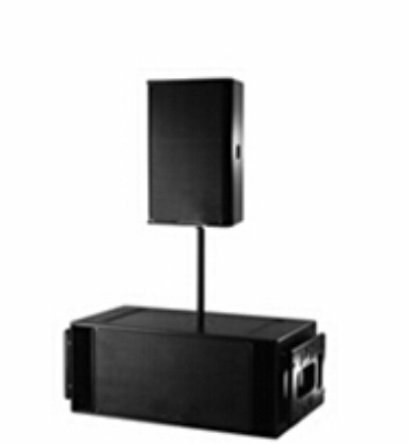 If needed or requested, additional speakers can be setup to fill in “dead spots” if the area of coverage is not met. 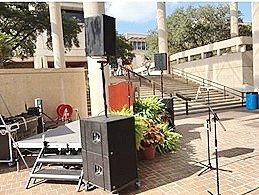 In this setup, 1 speaker is setup on- what we call- a medium size pole that’s attached to 2 subs. 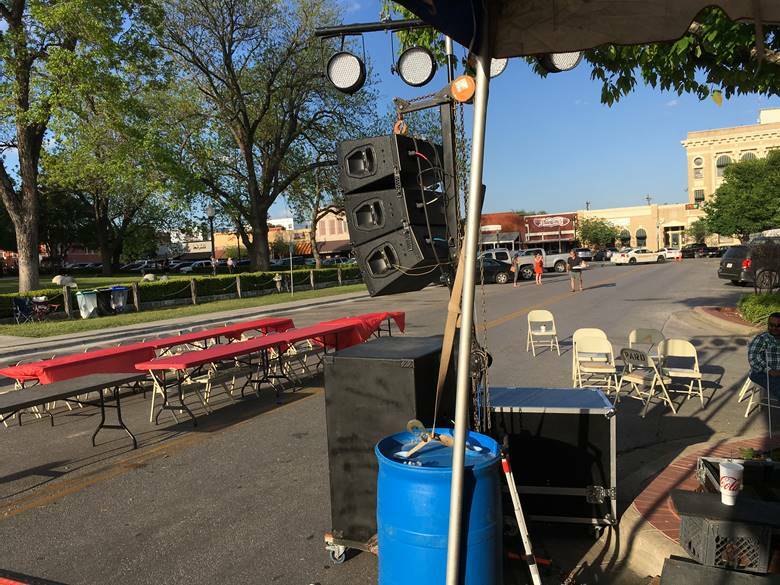 In this setup, 1 speaker is setup on- what we call- a large pole that’s attached to 2 subs. In this setup, 3 boxes were rigged and flown out on lifts just under the tent to give the audience an even coverage. 2 boxes of subs are underneath the 3 boxes in the air. 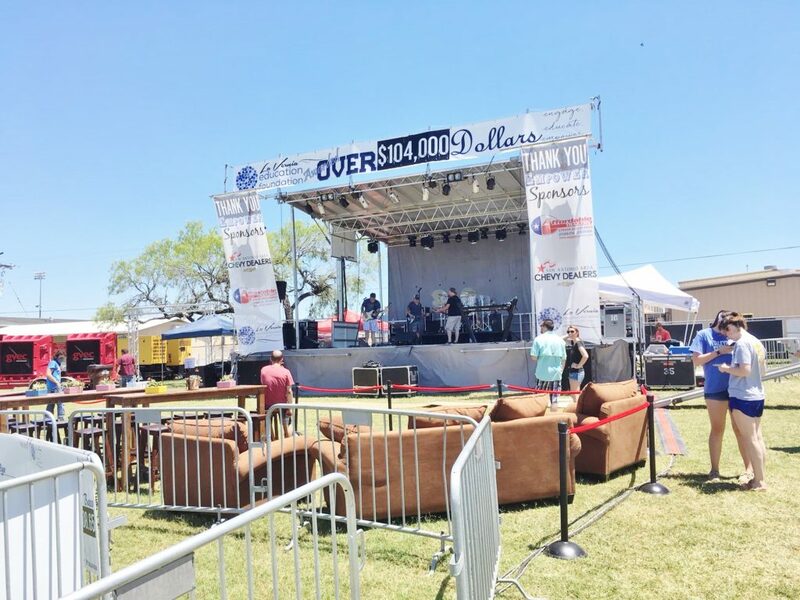 If you’ve ever been to the craft beer festival in New Braunfels, the PA used is 3 boxes a side, flown out on lifts, with four subs underneath them. This setup has 3 boxes a side, flown out on lifts, with 2 boxes of subs a side. This is a setup with 4 boxes a side, rigged and flown out on lifts, 4 boxes of subs a side. In this setup, 3 boxes are ground stack on 2 subs, and 1 speaker on a speaker stand is setup for an outfill, to provide speech intelligence for people in the bleachers. 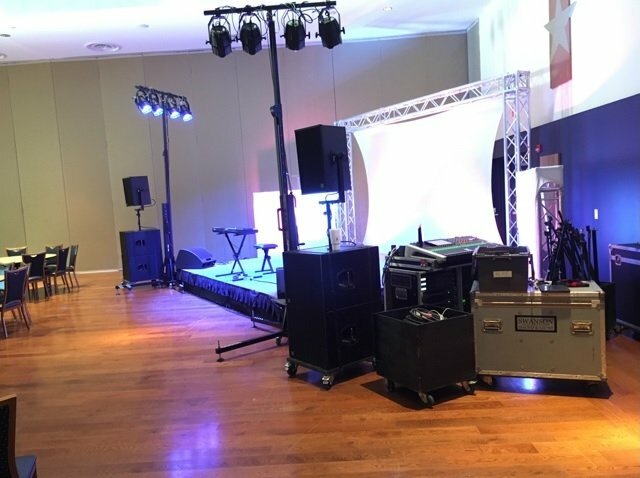 This is the same show as the picture above with 3 boxes that are ground stacked on 2 subs, and 1 speaker on a speaker stand is setup for an out-fill. 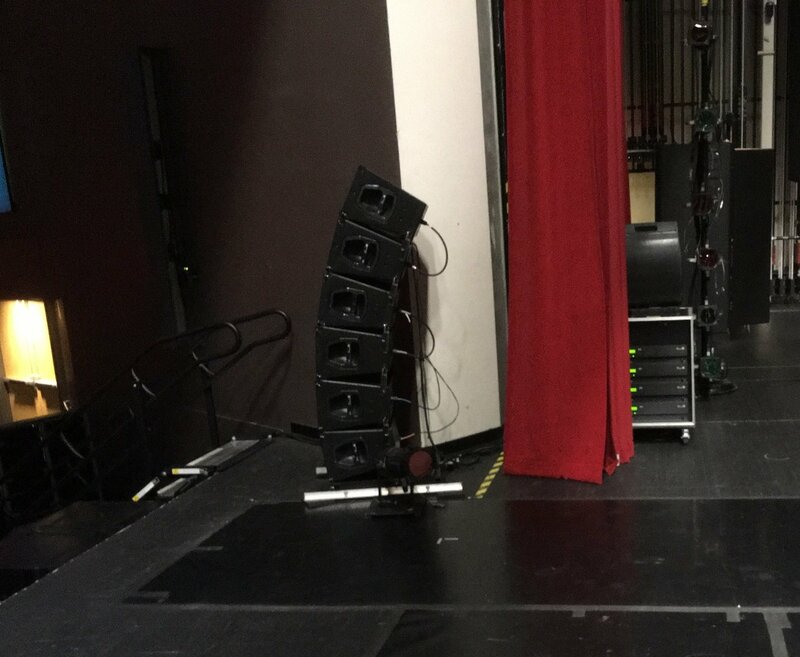 In this setup, 6 boxes were ground stack on stage to provide even quality sound to the audience. There are 4 boxes of subs on the floor in front of the stage. 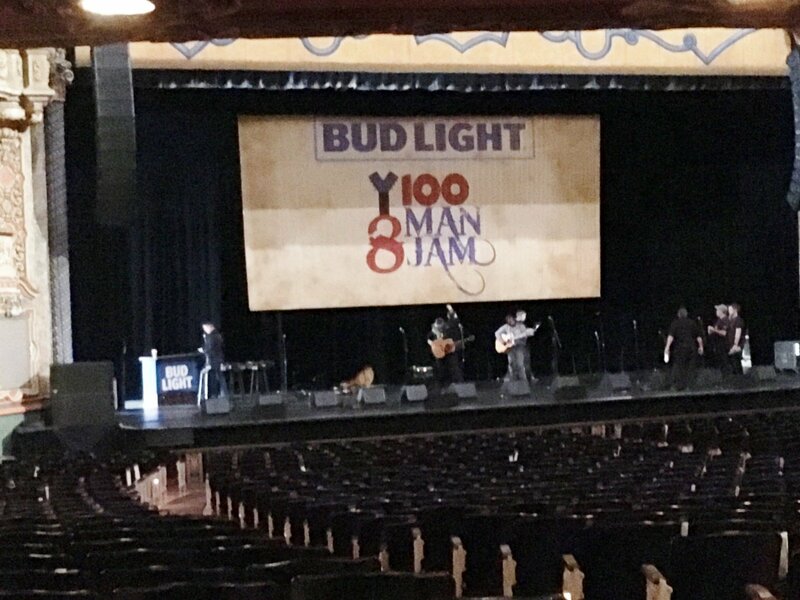 This is the same show as the picture above with 6 boxes ground stacked on stage. 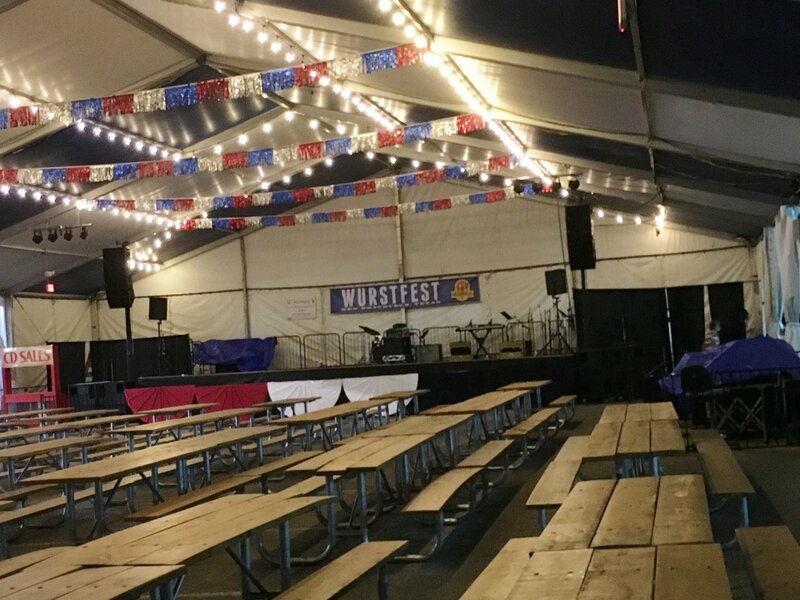 This is the BIG tent at Wurstfest, with 5 boxes a side rigged and flown out on lifts, and 4 boxes of subs a side. 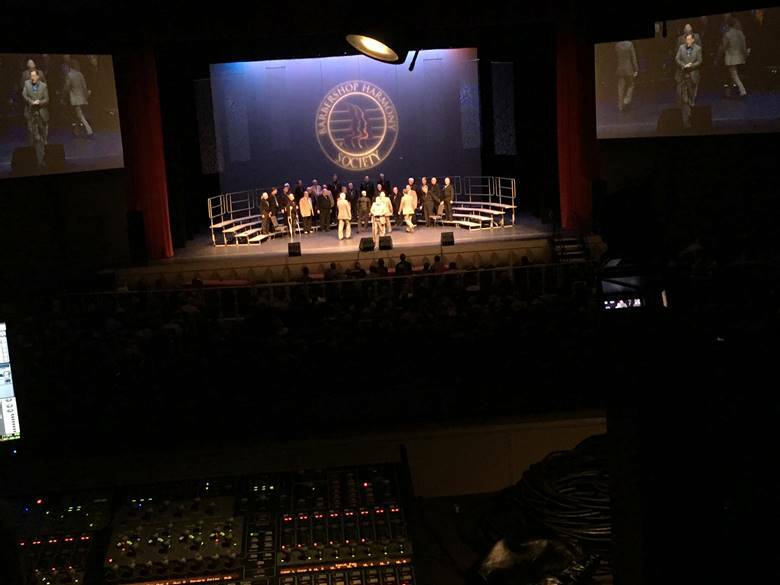 In this setup, PA was attached to chain motors behind the banners and flown out on each side of the stage. 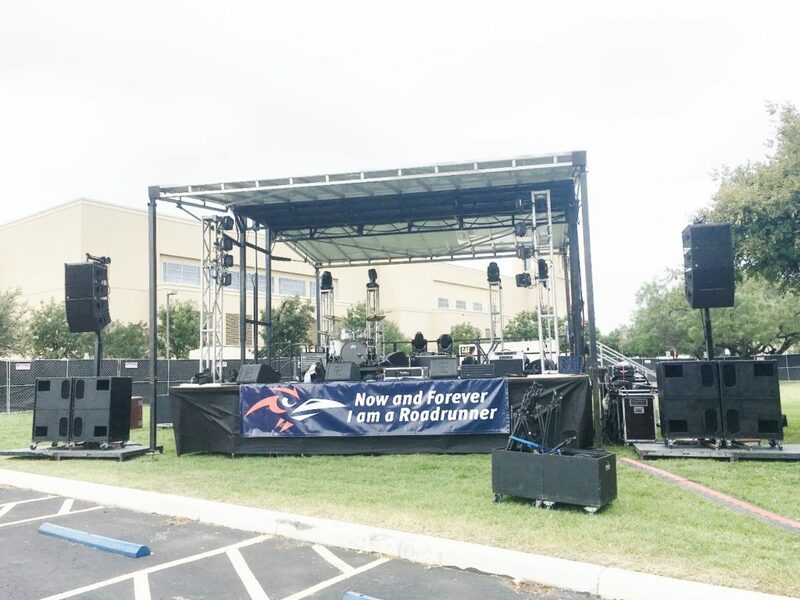 This setup is 10 boxes on each side of the stage, flown out on chain motors so they are suspended in the air. 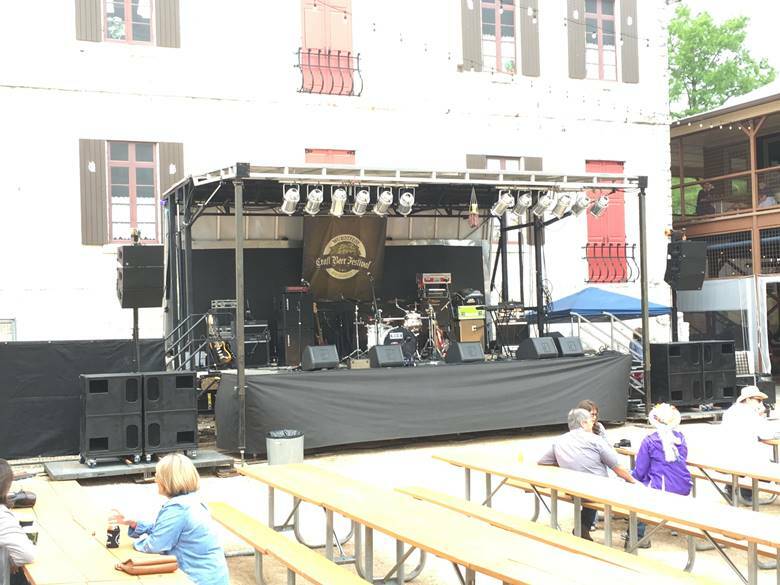 At this festival, the stage was tall enough to ground stack the PA on the stage. The subs were underneath the stage, behind the drape. Rigging or rigged is making something ready for operation; erecting, assembling, building it to be able to fly out. What does flown (fly) out mean? In the theatre, when someone says you are “flying it out” simply means, lifting it up or elevating it. When your “bringing it in”, it means it’s being lowered down. What is coverage and throw? Coverage is the area in which speech intelligent sound is desired. Throw is the distance from the sound source, to a desired location. So we are not tripping or kicking any breakers, what we are referring to here is the amount of duplex wallplugs that have its own 15-30 Amps of power “dedicated” to its own breaker in the panel. A light with a single color, without any movement or motion.